The severe cyclonic storm Aila, which struck Bangladesh in 2009, left a deep scar in the lives and livelihoods of the people. The impact of the tumultuous cyclone continues to affect the residents of Satkhira district (part of Khulna Division) in southwestern Bangladesh. Salt water intrusion during and after cyclone Aila has rendered the once flourishing rice fields of the region barren and uncultivable. “A lot has changed,” say community members. Intrusion of saline water has considerably reduced the sweet water pockets and there has been a sharp decline in soil fertility. As a result, most of the community members who were dependent on agriculture, fishing and animal husbandry, have limited options of livelihood. The cultivation of paddy, the staple crop of Bangladesh, was becoming increasingly difficult. As a result, the poor and small land holders in the region started working as labour at massive shrimp farms. But shrimp production began to decline after a few years due to contamination by microbial pathogens and the industry lost market value. To help the poor find an alternative source of livelihood amid saline water conditions, Oxfam Bangladesh and Shushilan, a local non-profit, launched a project called REE CALL (Resilience through Economic, Empowerment, Climate Adaptation, Leadership and Learning). Given the change in ecological conditions, crab fattening was seen as a good substitute. Crab fattening is traditionally practised in mangrove swamps, shrimp ghers and at the confluence of tidal rivers. The fish culture systems in Sundarbans region of Bangladesh proved to be excellent hubs for soft shell and mud crabs. Archana Rani Mondal, 32, from Magurakuni village in Satkhira remembers the grim days after cyclone Aila when her livestock and poultry had been washed away and her house had remained submerged for several days. Today, Mondal and many others in her community have found a lucrative source of income through crab fattening under the REE CALL project. 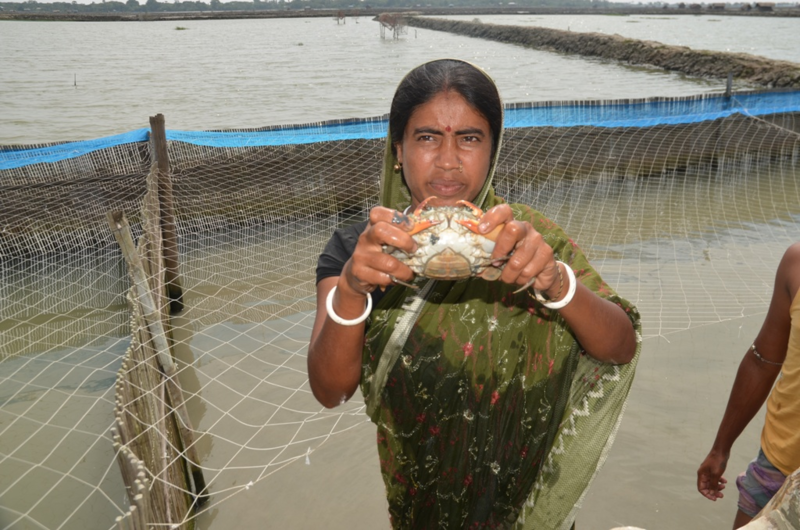 As part of the crab producers group, which started with seven to eight men and women, Mondal received training from Bangladesh’s Department of Fisheries in March 2011. She also received 7,000 Bangladeshi Taka (US $89) as financial assistance under REE CALL and materials such as bamboo case, drum, bamboo sticks, crab and rope to start the business. Mud crab aquaculture involves the capture and fattening of juvenile crabs from the wild. The mud crab, Scylla serrata, is abundant in the Pacific and Indian oceans. It is available in brackish coastal waters and estuaries and has great potential for aquaculture. There is high demand for Gravid females with full orange-red egg masses in seafood restaurants in Southeast Asian countries. Crab culture and fattening are, however, still at the experimental stage in South Asia. Mud crab of genus Scylla, also known as green crab or mangrove crab, constitutes an important secondary crop in the traditional shrimp or fish culture systems of Asian countries such as Bangladesh. Due to its export potential, there is a rise in the popularity of crab farming among the coastal communities in greater Khulna and Chittagong regions of the country. Crab fattening requires low investment and can be carried out in small water bodies. While crabs can be cultivated throughout the year, the post-monsoon period from September to December is most suitable for the marketing of produce. The catch varies according to the season. In the summer, a harvester can get 40-80 kg of crabs on an average per week. In the winter, this quantity increases to anywhere between 60 and 100 kg per week. The monsoon brings the biggest catch, weighing from 140 to 200 kg per week. A few kilometers from the villages, the fisher folk take a small boat out in the Sundarbans and catch soft shell crabs. These crabs are then reared and cultured for around 15 days in saline water. Once these crabs become hard shelled, their market value increases. They are then marketed and exported from Dhaka to countries such as Thailand, China, Malaysia and Singapore. “Sometimes the crabs can grow as heavy as 4 kg and fetch a promising 350 Bangladeshi Taka per piece,” says Mondal. If the venture succeeds, small farmers can earn between one and 1.5 lakh Bangladeshi Taka. Mondal now leads a producers’ group and has developed a formal arrangement with the local fisheries market at Jamuna Depot, five kilometres from her village. She is aware of the market prices and is well-versed with commercial transactions. She also received a certification from the District Fisheries Office during the National Fisheries week in 2014. “Earlier, I had not even stepped out of my home, but now I can go independently and deal with the market people at Jamuna depot,” she says. Research conducted by the Department of Fisheries Management and the Hajee Mohammad Danesh Science and Technology University in 2013 shows that 38 per cent of crab farmers interviewed were satisfied with crab fattening as a livelihood option. They cited quick economic returns and assured income throughout the year as reasons for choosing crab farming. Non-profits in other parts of southwestern Bangladesh have started similar initiatives to help people deal with salt water intrusion. Crab fattening is seen as a good way of adapting to climate change and its impacts. Better coordination among farmers, fishermen, middlemen and wholesalers can lead to improvements in this sector. I had the good fortune of reading your article regarding Crab farming. It was well-written and contained sound. I always enjoy your articles. Please accept my thanks and congratulations for this scholarly write up. Thank you and keep these good articles coming... Thank you Geetika for your thorough research and clear writing.